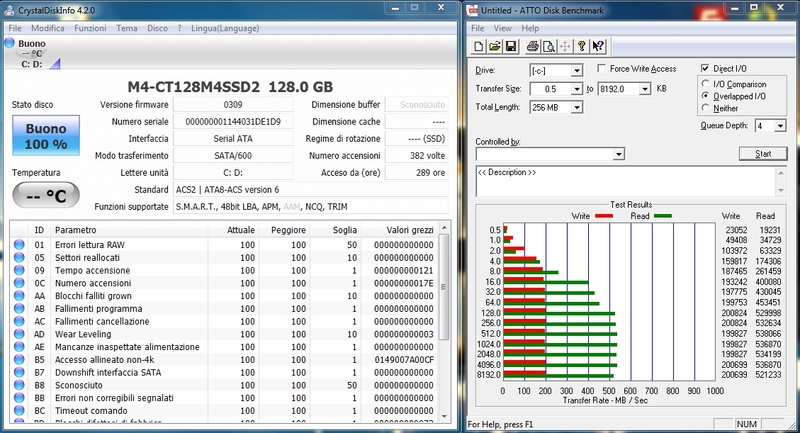 Yesterday Crucial released a new firmware for its M4 SSD series, the new version (codename 000F) is supposed to address some issues which used to appear when using the SSD connected to certain SATA/SAS controllers and generally improve stability and reliability. Going against one of my first rules “if it ain’t broke, don’t fix it” I decided to update the firmware of the M4-128 I’ve in my Thinkpad. Updating BIOS, firmware or whatever you want through Windows based software is something I always feel unsecure, so even this time I went with the USB/boot procedure. Like the last time Unebootin did the trick, 2 clicks and 30 seconds and the USB stick was ready to flash. Just to be sure everything was fine I did the usual “previous and after” comparison. Like the screenshots clearly show there isn’t any notable performance difference, so, if the SSD is correctly working I will not bother updating.